Welcome to the LPA Online Bookstore and Superstore! Buy all your books, music, videos, toys, electronics, and more, and Little People of America, Inc. will receive a percentage of your purchase price at no additional cost to you. Choose the one that says it is in CAVE CREEK, AZ (this is your District Office). That’s it… It will remember your choice! 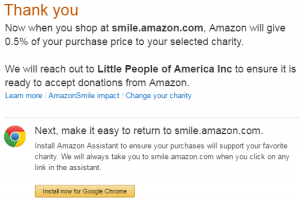 Better yet – make smile.amazon.com your bookmark and please be sure to tell your family and friends to do the same!